Tim arrived the Sunday night and Will arriving on the Monday afternoon. 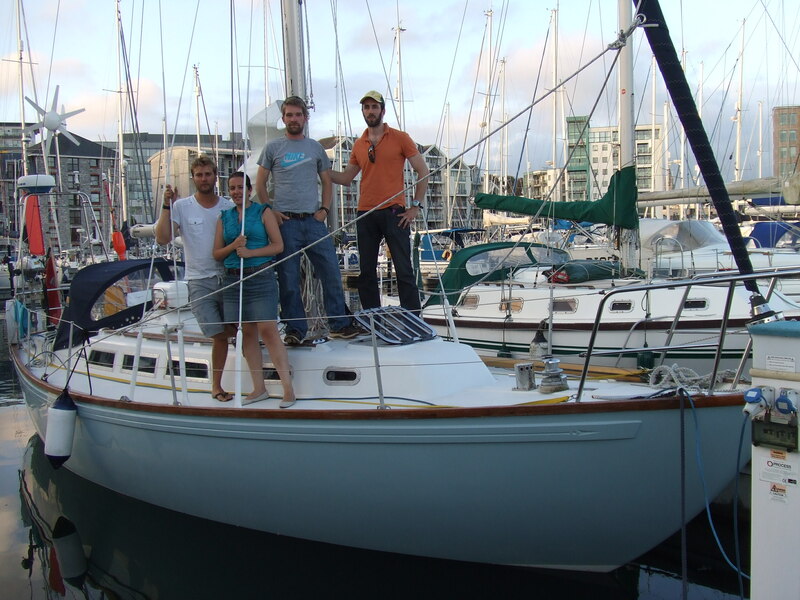 There we were the 4 intrepid sailors ready to cross the notorious Bay of Biscay. The weather window looked good. My strategy would be to head west and gain enough clearance off the continental shelf where the sea state would be more manageable and I would also have enough sea room away from the French coast. 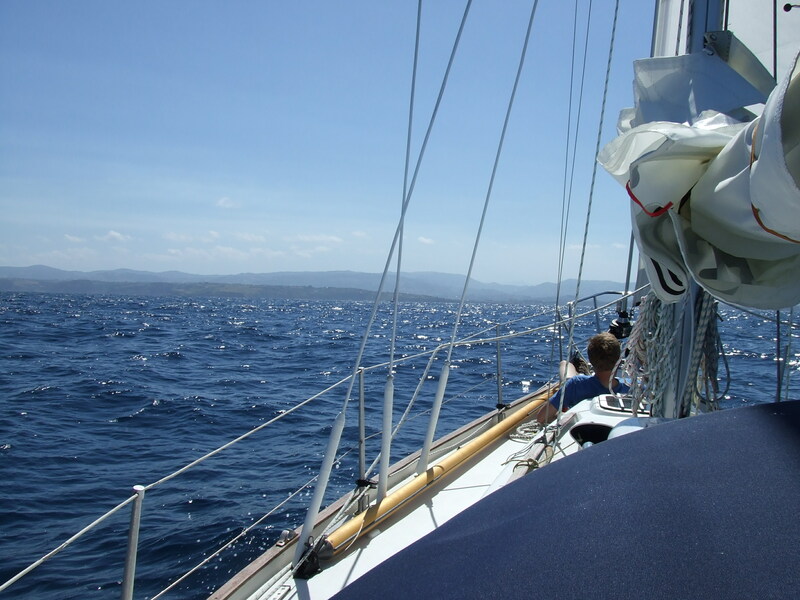 The passage would be around 475 miles and I expected to be at sea for around 6 to 8 days based on the wind. We were aware of a low pressure building up on the Friday but hoped to be clear of this by the time is reached it’s peak; unfortunately this was not the case as I will explain later. 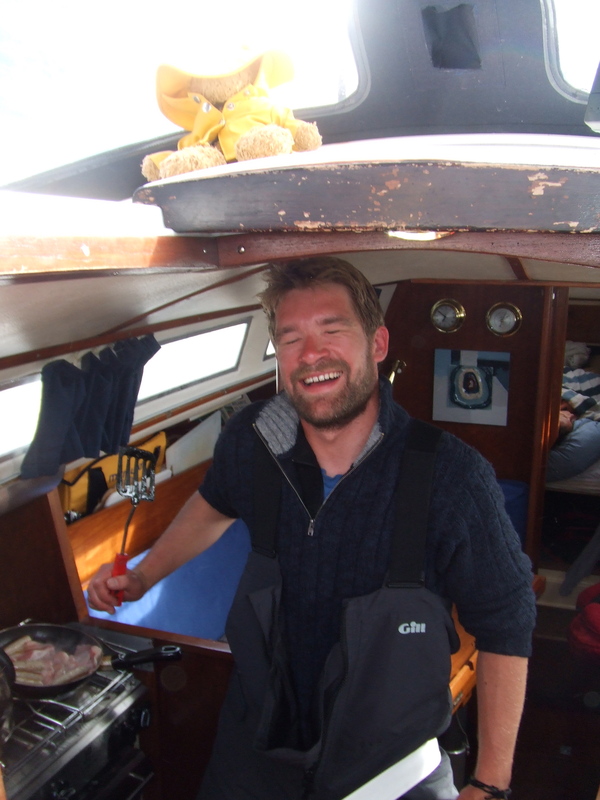 I sent Tim and Carlotta to stock up on food with Nita’s help in using her car, I spent the rest of the day with my Dad fixing reefing points in our main and fixing the deck light and running light which decided to falter due to a bad connection. We were pretty much ready by 20:00 and were set to depart at 21:30. I doubt anyone ever feels completely ready for a crossing such as this and I for one felt nervous about what lay ahead of us but together we made a strong team and would succeed. At 21:15 we made our way out of the lock at Sutton Marina and into the cold night air. The first night shift was left to me and Will and at around Midnight Carlotta and Tim went to bed. 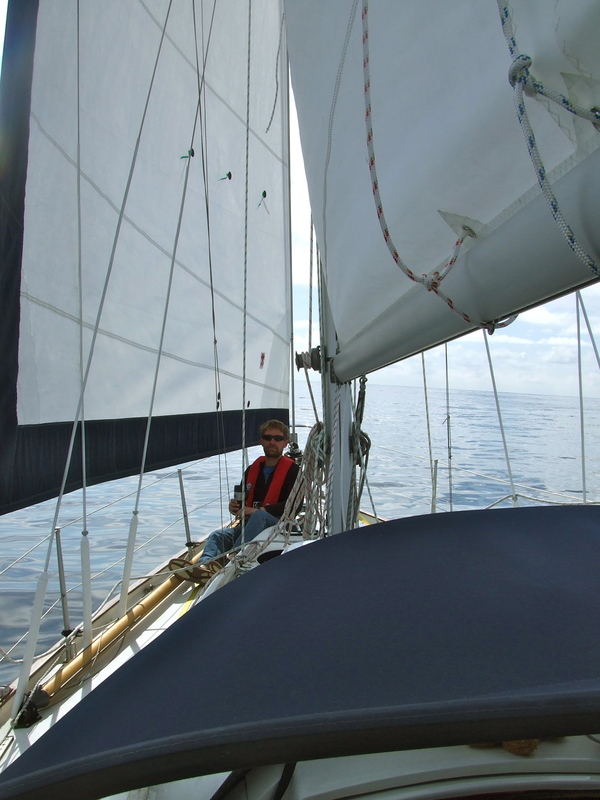 We sailed for a few hours but the wind was light and Westerly so we hugged the coast as much as we felt safe to do so. It seemed a life time to clear the Eddystone lighthouse. 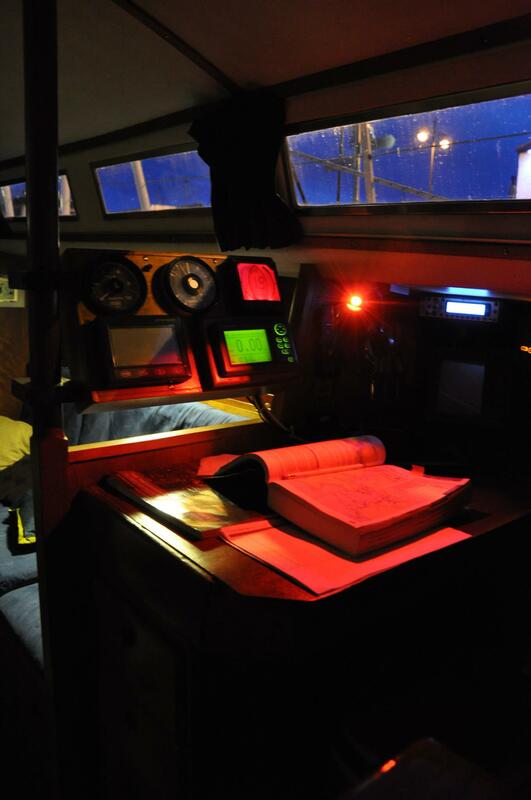 Will and myself were treated to a great show of Phosphorescence coming from Troskala’s bow, it was a first for Will but still an amazing sight as little stars in the water deflected off the bow and behind the stern. Before we know it we welcomed to an eerie dawn and a change of shift. For the second day the winds were again light so we motored to try and gain as much as of a westerly position as possible, but I was also aware that motoring constantly was not an option due to the limited amount of fuel we carry so when I awoke we tried to sail again but the wind had shifted Southwest so the best tack we could achieve was a South Easterly position so westerly ground we had made began to slide away. 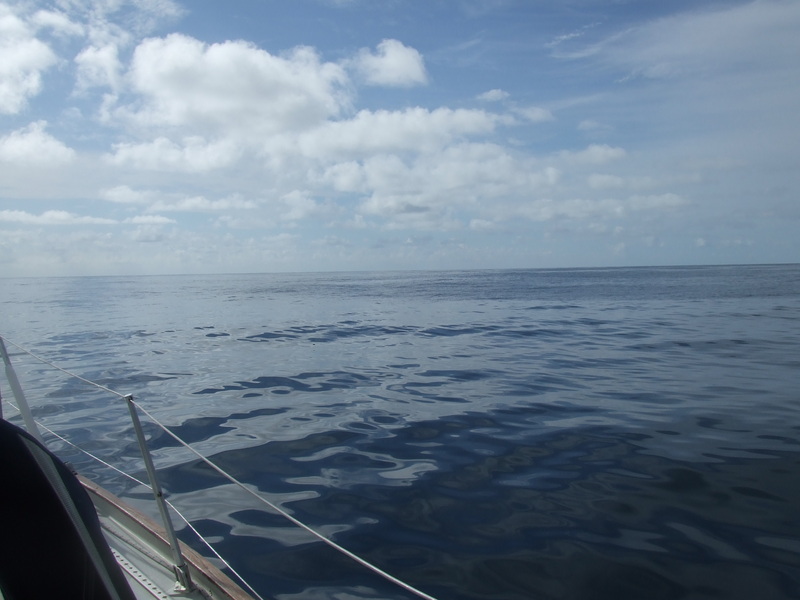 It is amazing that at sea the days move so fast, you basically see day and night as one entity and eating and sleeping as the key necessities to our passage. The mood and moral on board at the start of the trip was healthy with everyone getting involved. We managed to test out a new Sat phone and send positions to family and friends daily plus receive weather reports from my Dad. 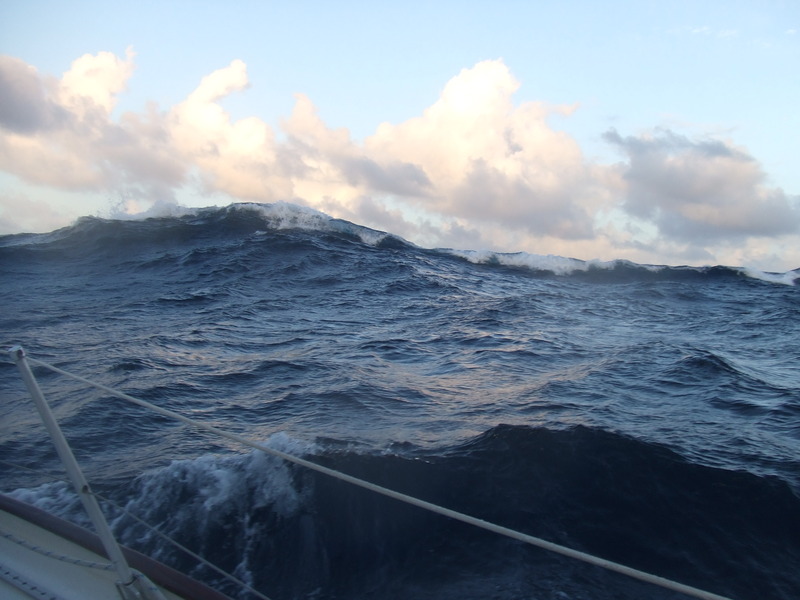 On the Thursday I was made aware of our low, which had now deepened and a forecast of winds up to 48 knots would soon catch up with us in the next 12 hours. It is never a nice thing to have to communicate this information when there is no way out of it. Tim and Will took the news well although Carlotta was told that wind would only increase slightly to save any panic; this worked well. We motored through the morning to again make as much sea room as possible as we would surely loose a lot of it during the storm. The night started well, again Will and me were on watch and we again treated to an amazing show of shooting stars, Dolphins, and the most intense Phosphorescence I had ever seen. The dolphins would also create their own Phosphorescence and they appeared to be torpedos of light underneath the boat. We had seen Dolphins earlier on in the day but the sight at night was spectacular. We had now set up our self steering gear (Henrick the Hydrovane) and he had safely steered us over 250 miles in challenging conditions. 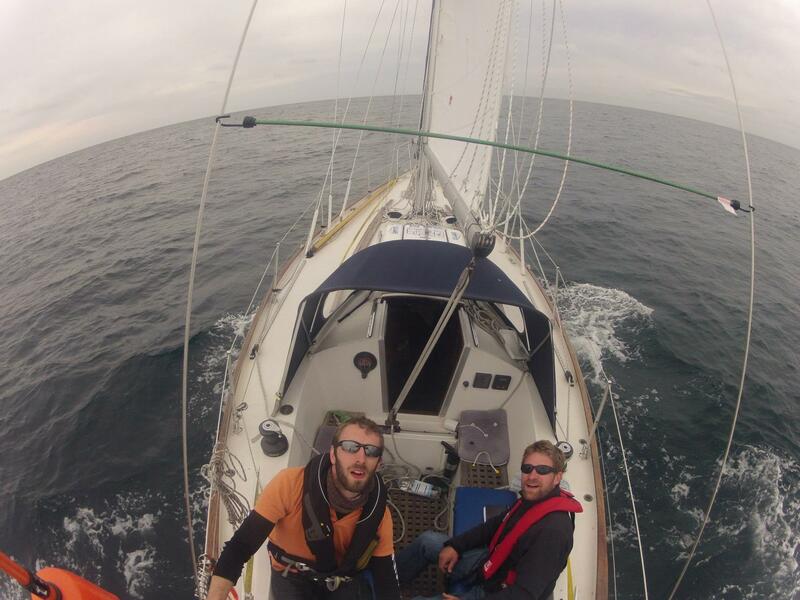 Towards the end of Will’s and my night shift the wind steadily increased to force 7 and the seas started to pick up. 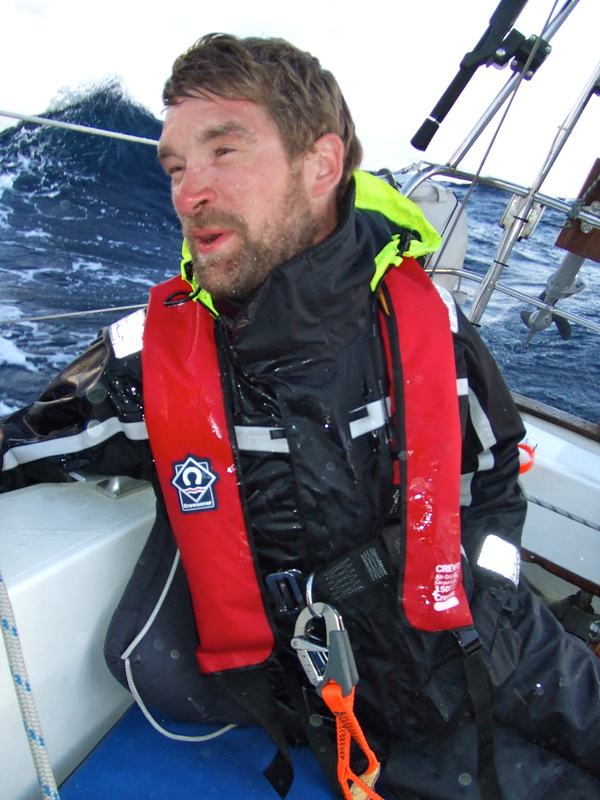 On the second day we were exposed to gusts reaching 38 knots and a swell of 4 meters. 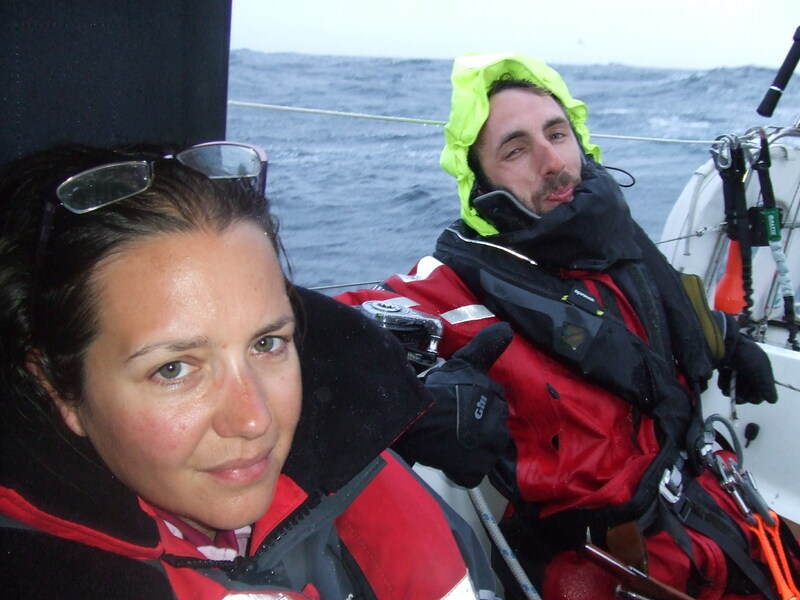 Luckily the wind speed and been reduced but we still all found the conditions challenging and both Tim and Carlotta were sick. I myself had several occasions of feeling sick but luckily nothing came of it. 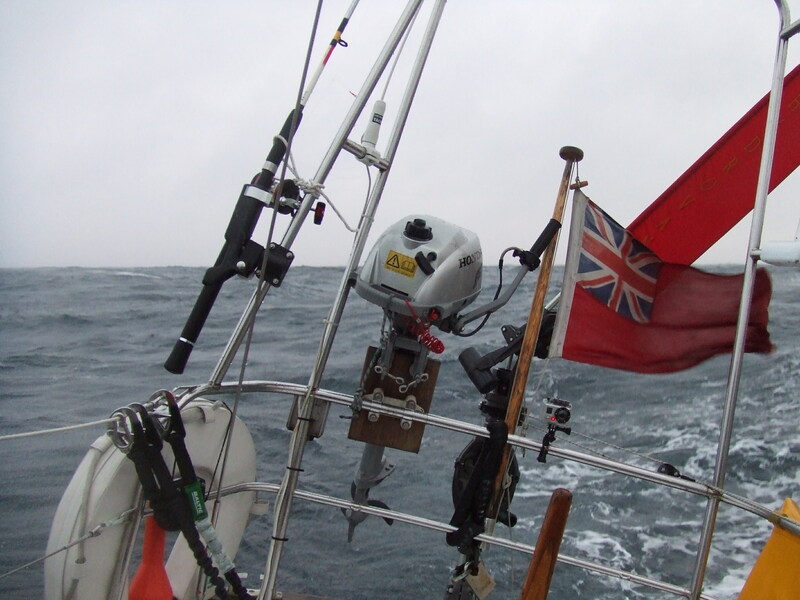 The wind continued to blow at force 7 for 3 days and by the third we had all had enough. We were all tired, wet and demotivated by the situation, in fact it was only Will who seemed to love having waves thrown at him. We cursed the amount of fresh food we had brought and I would have given anything for Pot Noodle, but we did manage to prepare some great pasta dished but had to throw a lot of food that needed more preparation. 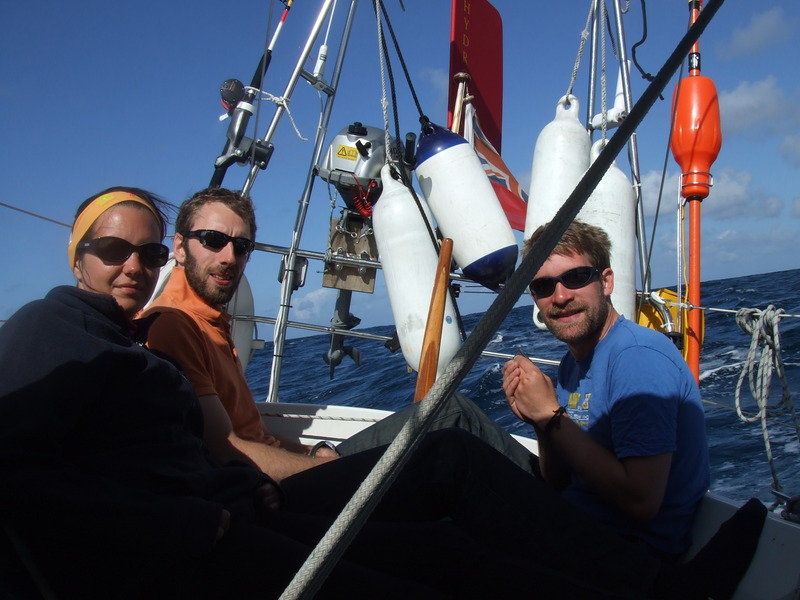 By the third day of the storm Troskala was on 3 reefs and a fraction of Genoa out, she held herself well and no damage was caused and rode over each wave quite comfortably. If anything our confidence in this vessel has increased immeasurably. At no point did we worry if the boat could handle the abuse and slamming that we were putting her through. On several occasion the slam of a wave was so great to wake us all up wondering if we still had the mast attached, but we needn’t have worried. 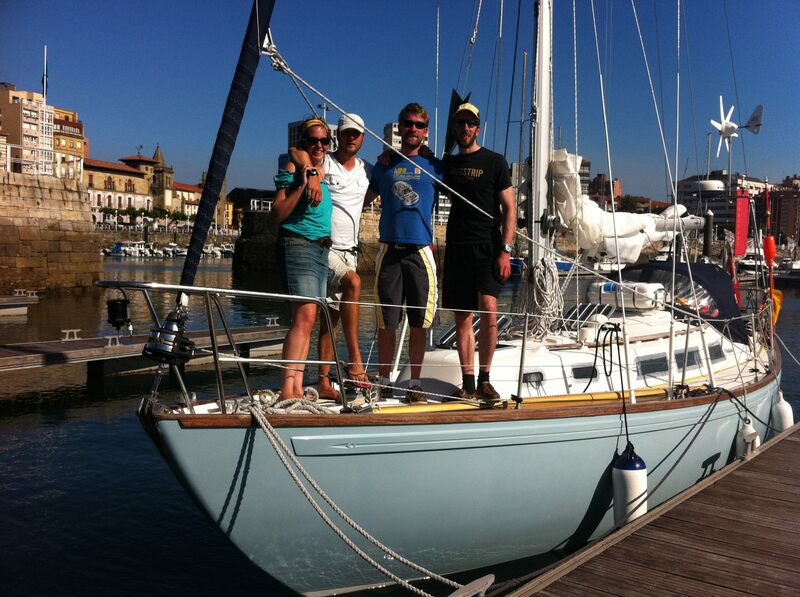 We saw the coast of Northern Spain on the 6th day and were left with perfect conditions on entering the harbor of Gijon. We had a couple more Dolphins welcome into Spanish Waters before we arrived. Food to be moved lower in the boat – we could not open some of our food cupboards without having a tin of beans flying at our heads. Reef early and use the topping lift to assist. 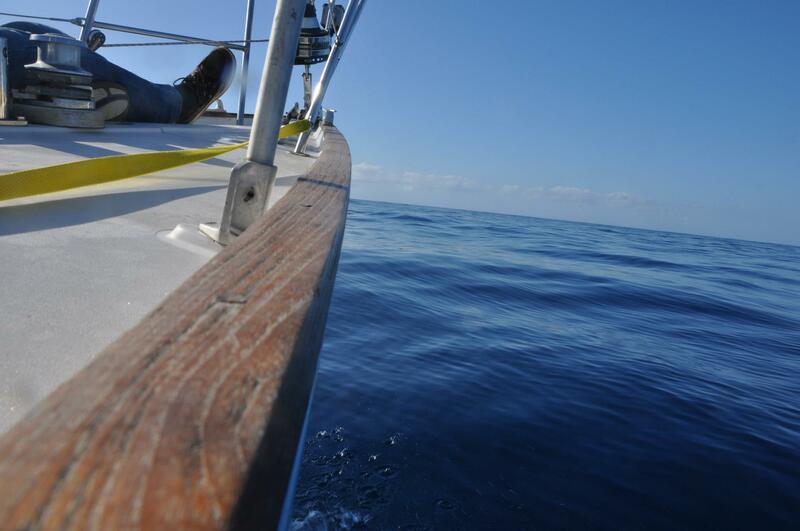 I would keep the Hydrovane running on a close-hauled point of sail and then try to reef. We should have disengaged the Hydrovane turned to wind and then reefed. I am sure the crew will offer more comments on the website and I look forward to hearing them. We are now in Gijon and will spend a week here whilst Carlotta catched up with her parents who are located in the next city. We will depart and continue West on the 3rd September. Posted on 31/08/2012 by magneticdeviationTagged eddystone lighthouse, transportation, travel. Very good work analysing the first step to Gijon. The most important thing is to go ahead. Enjoy the next steps in Galicia: Ribadeo, Betanzos, Coruña, Fisterra, Sanxenxo, Bayona etc.,,, Good look. Thank you One and enjoy your holiday and see you Sunday. Thank you for the message. Yes, made it and now enjoying the fine weather and food in Spain. How are things with you? Are you now back in St Katharine’s? I will keep you posted on how we get along and may need to ask you some questions on the way. Paddy, the invitation still stands if you want to join us anywhere. Good luck with the planning and hopefully you will be off soon. How are you Paddy. I hope all preparations are going according to plan. Still in Portugal but will be moving south south. Yes, correct, I have now suffered myself from slight sea sickness, not nice especially with just the two of us. Thank you for the note and more to come.